When I started traveling to Italy, I always wondered how they actually make Parma Ham (and mortadella too!). When I walked around any small town in Italy, I always saw large legs of Parma hams hanging from the ceiling. More often than not, they were stamped with a crown-shaped marking that bears a single word: “Parma.” But, how did they get there? I always wondered what the steps are to making Parma ham. What is Parma Ham? What is Prosciutto di Parma? What Is the Parma Ham Crown? Prosciutto di Parma, or more generally, Parma ham, has been around since Roman times. There are stories from 100 BC referencing the unique flavor of the air-dried pork from the area surrounding Parma. At the time, they dried pork to extend its life and prevent it from spoiling. A group of Parma ham producers created a Consortium, Consorzio del Prosciutto di Parma, in the 1970s, to control the quality of prosciutto. In 1996, the European Union gave the DOP designation on Prosciutto di Parma. Like all DOP and IGP products, the Consortium regulates the types of pigs that can be used, what the pigs are fed, and how the ham itself is produced. They regulate all of the steps in making prosciutto and every aspect of this particular Parma food product. How is Parma Ham made? What is Parma Ham made of? The Parma Ham Consortium likes to say there are only four ingredients in Parma ham: Italian pigs, salt, air, and time. In reality, it’s really only two ingredients. Although air and time are also key components. They make Parma Ham by curing a leg of pork with nothing but sea salt. This increases the tenderness of the meat and gives it a characteristic sweet flavor. Salt is the most key ingredient in how to make Prosciutto di Parma. A maestro salatore, or salt master, controls the production process, which has to be the coolest sounding title for a ham maker. After receiving the hind legs of the pig, the salt master thoroughly covers, and to some extent massages, the legs of ham with massive amounts of sea salt. Over the next few weeks, they hang the legs in refrigerated rooms, or drying rooms. The maestro salatore will clean and re-salt the hams as they cure and age. This is one of the most interesting parts of how to make prosciutto ham. Over the next 3 months, every leg of Parma Ham is hung in large, well-ventilated rooms, with windows at the end. This allows each leg of Parma Ham to be exposed to the climate of Parma, and the air: the fourth “ingredient” in Parma Ham. Similar to the Parmigiano Reggiano aging rooms, the smell is intoxicating. Often, the Parma Hams are hung in rows a half a dozen hams high, and dozens of hams long. Parma Ham legs as far as the eye can see. When we visited a prosciutto aging room for the first time, Eric was, literally, in hog heaven! As the months wear on, the meat of the Parma ham leg starts to change color. Whereas initially, the hams are bright pink, soft, and tender, the meat darkens, dries, and ultimately is hardened. The Parma Ham Consortium dictates that Parma ham must be cured at least one year, which is timed from the date of the first salting—although it’s possible to have Prosciutto di Parma aged for as long as 3 years or more. After aging it’s time to determine whether the Parma Hams can receive the Parma Ham crown, the official label of quality. When ready, an inspector from the Consortium arrives to test each and every leg of Parma ham. The inspector pierces the leg at five specific points with a thin horse bone needle, smelling the bone after each time it is removed from the ham. By smelling the meat, with a highly trained nose, it’s possible to confirm the quality of the ham. It is only after the leg passes inspection, and is fire-branded with the signature five-point crown, that the ham officially becomes Prosciutto di Parma. The Parma Ham crown is how you know you are purchasing hame that is of high quality. So, how is prosciutto made? It’s all a fascinating process, and it is understandable why Prosciutto di Parma has the reputation it does around the world. How to Make Parma Ham at Home? Although it is possible to cured meats at home, in a dark cellar, for example, it’s not possible to make “Prosciutto di Parma” at home. There are a lot of particulars about how Parma ham is made and the most important is the location. As much as Parma ham ingredients are pretty simple, the most important is time spent aging in the air of the Po River, and that you just can’t do at home. How to Visit a Parma Ham Producer? The easiest way is to book a Parma Ham Tour and Tasting from Parma, which you can do through Viator starting at €59 per person. What is Parma Ham vs. Prosciutto? Let’s talk about the difference between Parma Ham and prosciutto. Parma Ham is the more well-known and less formal way to say Prosciutto di Parma. Prosciutto, though, is made in many areas of Italy and would be named something different. The Parma Ham process is similar in these other areas of Italy, but are named locally, like Prosciutto di Modena or Prosciutto di San Daniele. What to do with Parma Ham? Although Parma Ham is not cooked Prosciutto di Parma is ready to eat. The salting and curing process makes it completely safe to eat. There is no reason to cook Parma Ham before eating it, although it can be added to pizza or stuffed into a pasta. It can also be added to salads, and yes served with melon. Or, try serving Parma Ham with figs drizzled with balsamic vinegar. Where to buy Parma Ham? It’s much easier to buy Parma Ham now than it used to be. 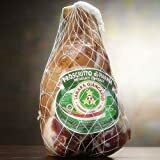 Just confirm that you are purchasing Prosciutto di Parma DOP to make sure you are getting the real stuff. Where to buy Parma Ham? How About on Amazon! There is more to learn about what to eat in Emilia Romagna. Parma ham is just one of the meat products discussed in the book. I’ve covered a lot of our travels in Emilia Romagna in our blog over the last few years, but I took it up a notch and wrote a book about what to eat in Emilia Romagna! This include includes plenty of Parma travel tips, including what to do in Parma Italy and where to stay in Parma. Where to Stay in Parma: Get recommendations on where to stay in Parma or find more hotel recommendations here. What to do in Parma Italy: Book a culinary tour with Food Valley. Learn more: Get the only guide you would ever need for Parma, Italy, the Food Traveler’s Guide to Emilia Romagna: How to taste the history and tradition of Italy, from Amazon. Or, get a copy of Pellegrino Artusi’s The Art of Eating Well to learn to cook traditional Italian cuisine at home.